WebMoney and NETELLER: 1 - 2 business days, Skrill: 2 - 7 business days, EasyEFT and PayPal: 3 - 4 business days, iDebit and Instadebit: 5 - 7 business days, ecoPayz and Credit/Debit Cards: 6 - 8 business days, EntroPay: Up to 14 business days. Mansion Casino is the original, flagship brand of the renowned Mansion group, which now operates several iGaming sites. It was established way back in 2004, long before the new breed of adventure casinos entered the industry. Such longevity isn’t easy to achieve, and few of Mansion Casino’s peers can match it. However, it also creates certain pressures. Veteran sites face challenges from an ever-increasing pool of contemporary, cutting-edge casinos, all of which can benefit from improved technology. The Mansion Group certainly hasn’t shied away from the challenge. They’ve been prominent sponsors of sports events over the years, including the 2006 World Cup. Their logo even adorned the shirts of Premier League football club Tottenham Hotspur from 2006-2010. There’s no doubting the size of their marketing budget then, but how does their oldest casino brand compare to its younger rivals? When compiling the Mansion Casino review and comparing the looks of an older casino with recently established sites is always an interesting task. Does the older site look stuffy or dated? Has it established the same level of functionality? Can it still make a memorable first impression? These are all questions we’ve asked ourselves when testing Mansion Casino over the past few weeks. Our conclusions are mixed. There’s nothing wrong with the design of the site at all. It’s tidy enough and adopts a classic layout that will be familiar to most. However, whereas some older casinos (Redbet springs immediately to mind) have renovated and revamped their design, Mansion Casino’s changes have been much more subtle. To say the site looks dated as a result would be harsh and misleading. But it’s hard to find any reason to recommend Mansion Casino’s visuals above any other platform. You can choose to download Mansion’s bespoke software or play from your browser, and we’re glad they give you the choice. We remain steadfast in our criticism of download-only sites, and always choose to play in-browser when presented with the choice. Browser-based casinos always look so much better and that’s the case here. As we said earlier, the desktop site is tidy and crisp. Its black colour scheme is inoffensive and allows you to concentrate on important matters like playing and winning. The design team have also implemented a mobile casino using much the same colour scheme and emphasis. But Mansion Casino also lacks a knockout feature or key selling point. This is a site that blends into the crowd. Given its wealth of experience, that seems like a bit of a waste. Modern innovations are great but they have also presented online casinos with something of a quandary. What do to with the Mansion Casino login? At their very core, they should follow the simple process. Players register, deposit, play and withdraw. Anything else is just supplementary, including bonus schemes and customer support. However, newer sites fail because they over-complicate the process, while older ones need to retain their relevance by embracing change. There’s little room for complacency. So, how does Mansion Casino fare? Well, initial impressions are good. The registration process is a doddle. You do have to enter card details (there’s no need to deposit) before you can claim your no deposit bonus, which is a bit odd, but sign up takes a couple of minutes. There’s no need to verify your account by email, which speeds up the process, but we respect the extra safety netting provided by this step when used elsewhere. When you’ve added your card details, you receive a helpful pop-up notification confirming your bonus. You’ll have no problem moving around the browser based site thereafter. A perfectly sensible top menu signposts you to key functions, including the game collection. Depositing is easy, and they’ve added a wealth of modern payment options over the years. Games open as an overlay, which displays a straightforward, if unspectacular, design with few bells and whistles – a link back to the cashier section is the sole exception. Loading times are a little slower than we’d like but don’t cause any great issues. The core functions are easy to use. It’s the customer support portal that causes us a bit of consternation. When you click on the ‘Support’ link, you’re transported to a comprehensive FAQ section. We have no problem with that, but when we decided to speak to a humanoid, we clicked on the ‘contact’ tab and expected to find live chat. Now, we’d read that Mansion Casino provides this service, yet couldn’t find it anywhere. We had phone numbers (great) but were clearly being prompted to email. Only when we conducted a separate Google search did we find the chat function – it’s provided by the Mansion group rather than the casino itself. It shouldn’t have been that difficult though, and response times weren’t the quickest either. Spend some time on our site (it’s highly recommended) and you’ll quickly notice our love of NetEnt and MicroGaming online slots. Closer inspection will also reveal our appreciation for Quickspin and Play N’ Go (my personal favourite). You won’t find games from any of those providers at Mansion Casino games, it took us time to adjust to that. Luckily, however, the site does boast a massive collection of Playtech slots, table games and poker varieties. It turned out to be a huge amount of fun and encouraged us to play some games that we’d never tried before. It’s bloody weird not seeing the ubiquitous Starburst in every promotion, but it turned out to be refreshing. Considering it doesn’t stock Mega Moolah or Mega Fortune, Mansion Casino has also put a very decent jackpot slot together. There are loads of local jackpots, including the complete superhero series from Playtech – Superman and the Green Lantern included. Network progressives like Jackpot Giant and Beach Life provide the prospect of a 7 figure win. You can’t help but miss the ‘stake low-win huge’ potential of NetEnt’s jackpot games though. Playtech insists you stake the highest amount for a shot at the biggest jackpots. The entire games collection could do with a little more in the way of filtering options. Subheadings are good, but the best modern casinos allow you to drill down into all sorts of shared features. In this regard, it does lag behind contemporaries a little bit. Finally, we’ve just about got room to mention the Mansion Casino live casino as well – it’s a good one, with plenty of variety. Given the recent crackdown by the UK Gambling Commission you’d think players would have seen the end of no deposit deals. 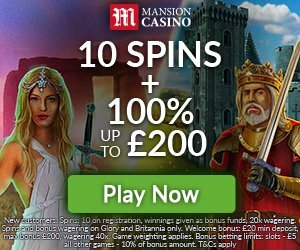 Luckily enough for you, Mansion Casino have a no deposit bonus offer on Glory and Britannia. The welcome bonus offers 100% up to £200 and 10 spins on registration for the slot Glory and Britannia. Coincidence with Brexit around the corner? The standard bonus is subject to x40 wagering requirements itself, a considerably less demanding undertaking than you find at other online casinos. Pop-up notifications guide you through the entire registration process and even prompt you to input your no deposit bonus code, so it’s difficult to get lost. This is winning welcome bonus package. Indeed, the size of the cash bonus has provided some compensation for the loss of our exclusive £5 no deposit free cash, an offer expired in July 2017. Even without that, it’s great to see Mansion Casino being so creative with their welcome bonus. Their decision to appeal to two different profiles of player is born out of those many years of experience in the industry. Important Terms: New customers. Spins: 10 on registration, winnings given as bonus funds, 20x wagering. Spins and bonus wagering on Glory and Britannia only. Welcome bonus: £20 min deposit, max bonus £200, wagering 40x. Game weighting applies. Bonus betting limits: slots – £5 all other games – 10% of bonus amount. WHY BECOME A REGULAR PLAYER AT MANSION CASINO? Aside from a couple of minor faults, Mansion Casino is a perfectly sensible choice of a regular casino. Its licensed by the UK Gambling Commission so British players can play as well as Europeans. Its experienced, secure, respected and big. The team operate a number of recurring bonuses and a simple, but lucrative, loyalty scheme to reward your custom. As long as you’re a fan of Playtech and/or Betsoft, this is a great choice. Our only concerns relate to the difficulty in finding live chat and the withdrawal process. Don’t get us wrong, there’s nothing to unduly worry you about the latter – Mansion Casino is entirely trustworthy. However, you can only withdraw by bank transfer, and we’ve seen reports of withdrawals taking up to a week, which is a little too slow. Our experience was better than that, but there’s room for improvement. Nevertheless, Mansion Casino has plenty of great attributes that will appeal to all sorts of players. It provides a simple, hassle-free gaming experience. Newer online casinos pop up with fully realised mobile sites as standard. However, sites that existed before the mobile gaming boom had to face up to the challenge of building one that works well alongside an established desktop casino, while retaining brand continuity. We suspect it isn’t as easy as it looks, but the Mansion Casino mobile team have done a commendable job. Much like the desktop site, it’s won’t blow your mind. But the Mansion Casino mobile version is solid and dependable, and you get to play a fine selection of Betsoft and Playtech slots from the convenience of your phone or tablet. On the downside, live chat is missing altogether and the main menu is a bit busy and cluttered. We found it easier to manage our account through the desktop site and just use the mobile casino to play games. The games load quickly and look good on both small and larger screens. It’s been fully optimised for use on loads of different devices for Android and iPhone/iPad. I’ve been playing it on a battered old Samsung S4 (yes, I’m cheap) and I’ve had few problems. They’ve done a good job with this. We’ve enjoyed the opportunity to try out loads of different Playtech slots for the Mansion Casino reviews. If you’re a fan of an either of those providers, or want to try something a bit different, then there’s a fine collection of games here. Playtech maintains its popularity in the UK, and Mansion Casino attracts plenty of players from its country of origin. That’s helped it maintain its position at the forefront of the industry in the face of greater competition, and it’s still a great place to play. The excellent choice of welcome bonus provides a compelling enough reason to play too. Beyond the bonus, this is a solid, dependable and highly experienced site with only a couple of issues to address.